With touches of history scattered throughout, the lobby of the Mercantile hotel in downtown Missoula is taking shape, with a grand opening slated for early February. 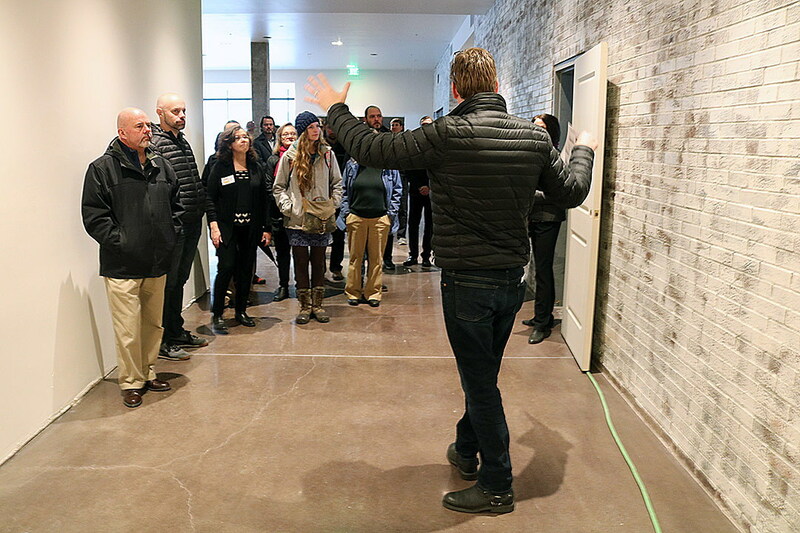 HomeBase LLC, the Bozeman-based developer, led members of the City Council and economic leaders on a tour of the facility Monday, revealing a finely appointed project that represents a $40 million investment in Missoula’s downtown core. Aside from a hotel staff of roughly 40 employees, the ground floor fronting Higgins Avenue and Front Street includes nine commercial spaces. As of Monday, Holloran said, seven are under signed leases. That includes the Montana Scene and Basil, and Olive and Iron – an existing retailer that will relocate to the hotel, gaining more exposure and foot traffic. The corner space will house a new restaurant dubbed 1889, launched by the same family that owns The Keep on Missoula’s south side. The new eatery will offer “contemporary American dining,” including steaks and seafood. While two months of work remains before the Mercantile opens its doors, the progress made so far has been years in the making. The project was first unveiled as a proposal in March 2016 and was approved by the City Council more than a year later. That approval came with a controversial deconstruction permit for the historic Mercantile, a structure cobbled together over decades with portions dating back to the 19th century. The new hotel retains elements of that past, including heavy timbers and wooden planks salvaged from the older structure. While most of those present Monday acknowledged the property’s past, they also saw optimism in the future. The project broke ground in July 2017. With nearly 200 rooms and nine retail and restaurant spaces, McCarthy believes the new Mercantile will restore what was lost as the old Mercantile sat vacant and fell into disrepair after Macy’s closed. 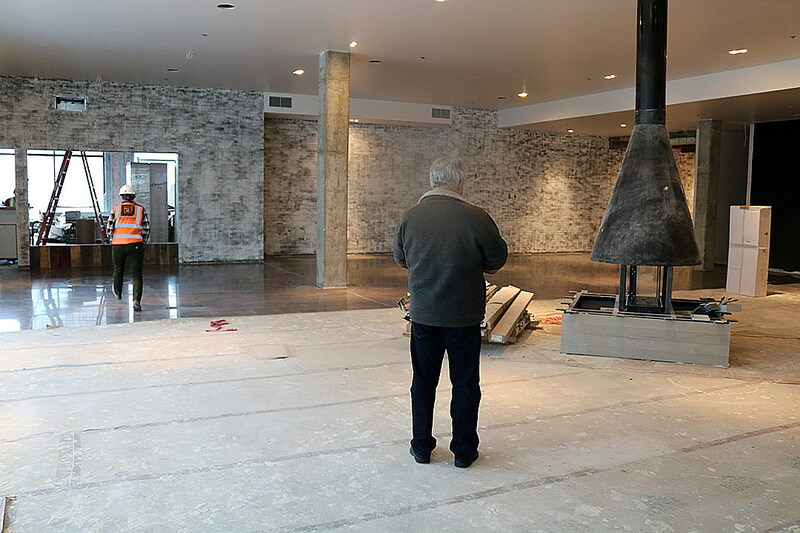 The new hotel includes an expansive lobby with a fireplace set in the center. The long-promised “Mews,” cast in whitewashed brick, extends down the length of the hotel to an entry off Higgins Avenue. It’s there where the old copper crown taken from the Mercantile will hang. The Mews will also showcase a robust collection of permanent art and historic images through a partnership with the Radius Gallery (that story coming Tuesday). Lacy Dequatrro, hired as the hotel’s new director of sales, and Kerry O’Kelly, the general manager, joined Monday’s tour with plans to have the hotel up and running the first week of February. 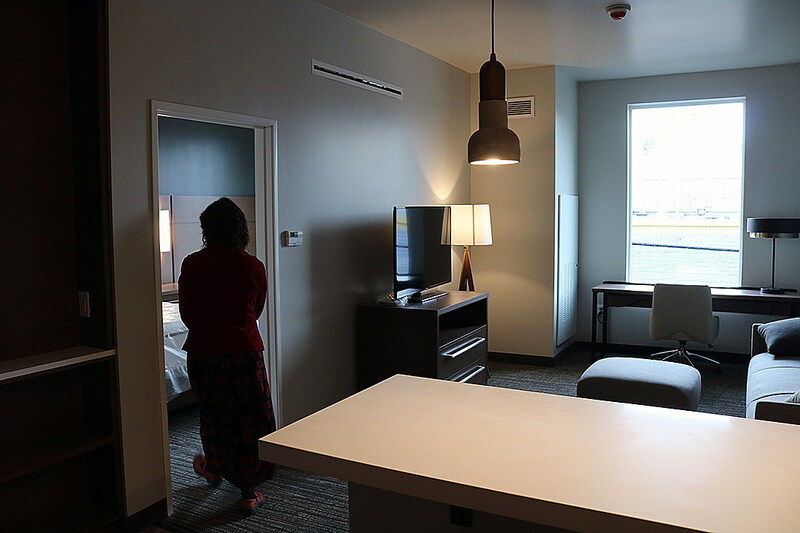 The new development showcases the work of a number of local contractors, from the salvaging of old construction items to the audio-video components slated for the lobby. But it’s the opportunity to restore energy to the downtown corner that has Holloran most proud of the project.